Tahiti may have come out victorious in the first leg of their 2018 FIFA World Cup Russia™ Qualifier – OFC Stage 3 encounter against Papua New Guinea last week, but their opponents are keen to come back hard and fast in tomorrow’s return leg in Papeete. 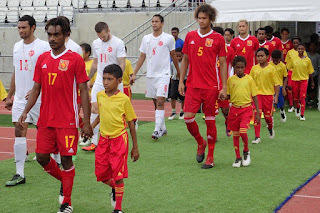 Papua New Guinea were stung by the sending off of young attacker David Browne in the 22nd minute forcing them to play well over an hour of football with a man down. Despite the disadvantage, the remaining ten players put in an outstanding shift to go a goal up, and were unlucky to see Tahiti knock three past them late in the game. “We have shown we can play them and if we had been 11v11 I think it would have been a better game,” Papua New Guinea coach Flemming Serritslev said. It was a tough end to a match in which a new-look Kapuls had been keen to showcase their abilities and carry on the form which saw them through to the OFC Nations Cup final for the first time just under 12 months earlier. “The attitude of the players was actually very good,” Serritslev said. On a positive note, Lae City Dwellers captain Raymond Gunemba will be making his international return after serving a suspension in the first leg, and his speed and ability to combine with Nigel Dabinyaba on attack will be difficult for Tahiti to contain. Flemming is also pleased that Dabinyaba and captain Michael Foster are not suspended for the return match in Papeete. The Dane had thought the yellow cards they received were their second accumulated cautions, but all single cautions were wiped following the OFC Nations Cup. For Tahiti, a win in their fourth and final Stage 3 group match should be enough to secure their place in the final against the winner of Group A. However having experienced the grit and determination of their opponents in Port Moresby, coach Ludovic Graugnard knows they’ll be out to prove that with a full complement on the field they are no easy beat. And he admitted his side needs to settle into the match much quicker if they want to earn a second victory. “We weren’t particularly settled after the sending off in Port Moresby and that was evident in our game,” Graugnard explained. Having seen the skill of his opponents in set-pieces, and knowing the return of Gunemba means pace and unpredictability up front, the Frenchman expects a strong defensive performance from his team. But also believes that with six points, Tahiti has a mental advantage over the Papua New Guineans which will play in their favour. “We will go home with a lot of confidence,” he said. Vital Statistics: If Tahiti are to beat Papua New Guinea it will be their tenth victory over the Melanesians in a senior men’s international. The Players: The return of Jonathan Tehau and Tauhiti Keck to the squad will bring a new element to their attack. While the addition of keepers Stevens Hiriga and Bruno Tetuanui, who were both recently on-form in the OFC Champions League, could see Mikaël Roche lose his spot in the starting XI. Vital Statistics: When 18-year-old goalkeeper Kusuga Komolong took to the field in the 90th minute at Sir John Guise Stadium, it marked the first time the three Komolong brothers, Kusuga, Alwin and Felix, had been on the field together in a senior international. The Players: The return of Raymond Gunemba will give Nigel Dabinyaba a familiar partner up front. The duo have played together for years and are a lethal combination as shown during the OFC Nations Cup.